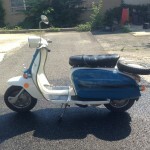 Here we have it, a lovely blue and white mid 1970’s Serveta Lambretta Li150. 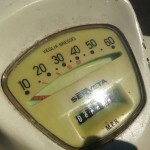 The Good: It’s a Lambretta. It’s pretty and two tone. It only has 2700 miles on it. All the parts are there. The Bad: It likely needs and engine rebuild and good once over. 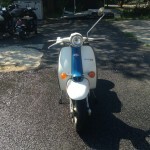 This bike has no title so it will have to be gotten through affidavit, Vermont, or other means. 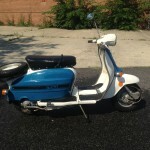 For $1700 you can rebuild the motor and work on this scoot yourself. For more we can provide the parts you need to do this. 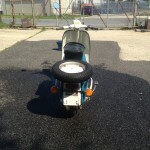 For even more we can rebuild the motor for you and get this thing back on the road and in its full Lambretta glory. Swing by and check her out today!